Today there is a Voices of Peace workshop in Auckland where the nature of Islamophobia will be examined by Muslims and non-Muslims and moves made towards forming a broad activist network which will campaign against racism and other social injustices. GEORGE GALLOWAY will give the introduction. 2-5pm, Sunday 29 July. Fickling Convention Centre, 546 Mt Albert Rd, Three Kings. Limit of 250 participants, so those interested are being advised to get there early. Plenty of off street parking. NO DOOR CHARGE. Donations will be accepted. "To be a good radical Muslim you must kill Christians & Jews." "Muslims always build mosques on mountainsides... [as] places to retreat when they have destroyed the surrounding cities." "Mosques [are their] centre of war... this is the main purpose/activity of every mosque in the world." "Muslims tell lies [which are] sanctioned by the Qur'an." "The Qur'an says you must terrorise the people who are not Muslim." "The Qur'an sanctions the killing of non-Muslims to advance Islam ­ but not the killing of virgins. They are [first] raped and then killed." "In Islam your wife is your property, an animal, she must be corrected by beating[s]." "Muslims... have sad, angry faces." RAM organiser Grant Morgan, a convenor of the Voices of Peace meetings, posed these questions: "I ask Mr Carpenter: if this is not Islamophobia, then what is it? I say to Mr Carpenter: how can you defend such blatant race hate talk? I ask Mr Carpenter: Why are you defending the Australian extremists like Mr Shayesteh who are now touring New Zealand trying to create a race hate movement in our country?" "While I am not a Muslim, I have been inside almost all mosques across Greater Auckland. I can assure the people of New Zealand that, contrary to Mr Shayesteh's lurid claims about 'every mosque in the world' being a 'centre of war', there are no caches of AK47's in the storage cupboards or stacks of bomb-making gear in the basements of this region's mosques," said Grant Morgan. "RAM will be campaigning hard in the looming council elections in Auckland against the Islamophobia that Mr Carpenter is defending," said Grant Morgan. "We will be saying - We ALL belong here. RAM believes that all councillors and all council candidates have a public duty to protect our communities from the sort of race hatred that Mr Shayesteh and other Australian Islamophobes are now trying to spread inside our country." A full report on the open section of the Wellington Mosques and Miracles conference is below. There have been 15 conferences in 5 nations. Pt 3: What God is doing (supernatural responses) and what "we" can do - "what to say to a Muslim if you happen to find yourself sitting next to one on the train"
Public meeting began with an excited crowd on its feet...mass singing accompanied by loud "rock" band ­ - lots of repetition of praise, hand waving, some in a state of rapture...all this while our Honorary Consul for Israel, with wife and two others, sat quietly bemused...though it was soon evident how delighted Mr Zwartz must have been with the objectives of the "missionary team". _ Westerners have no experience of Islam and don't understand ­ don't know the facts and TRUTH. Added a story about an Egyptian, Zakariah Botross, who was visited by Jesus in a dream and then by the holy spirit. He is a Coptic Christian and cannot live in the Middle East as converts to Christianity must be killed. He now lives in the States...the FBI told him that one man had come to the US just to find where he lived ­ there is reward for millions of dollars on his head. _ It is a myth that Christians, Muslims and Jews worship the same God. The God of Christians has a personality...is a personal God. The God of all other religions, particularly Islam, is impersonal. "The Christian God is lovely, he is the best!" and the admiring crowd smiled with knowing delight when Daniel shouted "Jesus is yummy, he's delicious!" Whereas Jesus of the Koran will return and destroy the Cross and Christianity...much tut-tutting followed this. _ Christians and Jews are unclean - Mr Zwartz and friends did not look concerned - ­ and you must cleanse yourself after touching them or having them in your house...and the cleansing is expensive. Jew and Christian are the worst swearwords in Islamic countries. _ To be a good radical Muslim you must kill Christians and Jews. Hizbollah was started as an army to take over Israel and kill off Jews...it was to capture Lebanon with Israel as the goal. Then move on the US where there are many Jews. _ Muslims always build mosques on mountainsides...wherever they are (indicating the surrounding hills) they will search for places in the mountains...they have maps. These are safe havens where they can plan in isolation and places to retreat to when they have destroyed the surrounding cities. This is why they live in caves in the mountains of Afghanistan. 1. Centre of War ­ against non-Muslims...non-Muslims are ingenuous and don't realise this is the main purpose/activity of every mosque in the world...the idea of peace is a myth ­ a lie. 2. Build the mosque, own the country ­ when a mosque is built, then in Islam's eyes that country belongs to the Islamic world and not to the non-Muslims who live there. "Is there a mosque here?" A resounding "YES" is the reply as the audience looked around at each other. This is going to be the destiny of your country, they have a plan. Wake up! Then he said he wasn't there to frighten people and promptly mentioned that, as part of his Islamic training in Iran, he had been taught how to cut of the heads of non-Muslims...gasps from the audience. - Muslims tell lies ­ sanctioned by the Koran...in Islam it is okay to lie in order to further the aims of the religion. Great emphasis placed on lying...theme repeated throughout the talk. The leaders all know the truth, their followers will not. They lie about the true aims of Islam and westerners gullibly believe them ­ because we are so nice. _ Islamic law is the worst in the world because it is of God and cannot be questioned...in contrast to Communism which is of the people and can be overcome. _ The Koran says you must terrorise the people who are not Muslim...it is joy in Islam to give pain to your opposition. _ The Koran sanctions the killing of non-Muslims to advance Islam but not the killing of virgins. They are raped and then killed. _ Apostasy (conversion from Islam) is punishable by death...much reference to this by example. He elaborated on persecution stating that this was the typical experience of non-Muslims in Muslim countries...some convincing examples from Saudi Arabia. He referred to recent stories from Iran of people killing their own children who had converted...he said they had no choice because Allah teaches that Christians need to be killed. The people have no choice ­ if they do not kill their children, the whole family will suffer humilation and ostracism. _ Women must be veiled from the age of 7 as they can be married at this age...more horrified gasps from audience. The paedophilic intimation was obvious. He gave examples of old men with wives, as young as 6, and asked the audience to imagine what it would be like. Reference, with quotations from the Koran, about Mohammed's marriage to a 6yr old which was consummated when she was 9. _ In Islam your wife is your property, an animal, she must be corrected by beating. Jesus said love your wife. Daniel apologised to his wife when he converted and called her "honey". _ Christianity takes away the uncertainty of one's future...there is security of eternal life, of happiness, of justice. No other religion guarantees salvation in return for simple belief. "Christianity is the best" and "Jesus is nice"... "the people are lovely...the music is lovely too". _ Muslims are taught to hate and to punish...they have sad, angry faces. He repeated this and finished with a picture of his three smiling daughters and wife and commented on their lovely hair ­ earlier we had seen a photo taken when they were younger in Iran, dressed in black and hair covered...serious faces ­ he said their expressions were due to Islam. "That was one man who was trained to hate, kill and destroy. God can work amazing changes in our lives. Once an agent of destruction and death and now an agent of love and life." Made a comparison with Saul becoming Paul after meeting Jesus on the road of Damascus. Prayers followed, especially for people who stood because they felt particularly moved by the presence of God this night ­ the pastor asked that "God would visit these lives supernaturally tonight". He then asked for pledges to support the mission ­ and asked people to buy the DVD of the night on sale in the foyer. "What will you do to continue this work? I ask you in the presence of God." Emphasis on taking action before it is too late. The mission will continue in many nations...in the UK next year. Muslims need to be saved...pray for them...hug them! Contrary to statements made by organisers of the ³Voices of Peace² conference, the Mosques and Miracles conference speakers and attendees are anything but Islamophobes. Glyn Carpenter of Vision Network of New Zealand, who has helped promote the Mosques and Miracles conferences, says ³the conference is essentially a reminder to Christians of the basic teaching to love others. Certainly the speakers are sharing from their considerable experience of Islam, which includes living in Islamic countries, about the diversity within Islam, and issues to be considered. It is ironic and concerning that organisers of a conference called ³Voices of Peace² would use terms like ³NZ Islamophobes², ³Aussie extremists², and ³far-right Islamophobic idealogues² about this conference. Auckland Girls Grammar School Theatre. 16 Howe St (off Karangahape Rd). JAVED KHAN, president of Federation of Islamic Associations of NZ. PAUL BUCHANAN, international security analyst & director of the Working Group on Alternative Security Perspectives. GRANT MORGAN, organiser of RAM - Residents Action Movement. Limit of 800 seats, so those interested are being advised to get there early. NO DOOR CHARGE. Donations will be accepted. Off street car parks available. Library Basement, University of Auckland, Alfred St, central city (opposite Maidment Theatre). NIBRAS KARDAMAN, young Muslim woman & representative of the Working Together Group. HANNAH SPIERER co-leader of Greens on Campus. NO DOOR CHARGE. Donations will be accepted. Both meetings OPEN TO THE MEDIA. There will also be Voices of Peace workshops where the nature of Islamophobia will be examined by Muslims and non-Muslims and moves made towards forming a broad activist network which will campaign against racism and other social injustices. George Galloway will give the introduction. Fickling Convention Centre, 546 Mt Albert Rd, Three Kings. Limit of 250 participants, so those interested are being advised to get there early. Plenty of off street parking. NO DOOR CHARGE. Donations will be accepted. Voices of Peace public meetings, featuring British MP George Galloway, are being held in Auckland on 27-29 July to counter the first stirrings of organised Islamophobia in New Zealand. These meetings (advertised at bottom) are being hosted by RAM, the Residents Action Movement. "A group of far right Islamophobic ideologues from Australia, headed by Stuart Robinson and Daniel Shayesteh, have entered New Zealand to wage war against Muslims and their religion," said RAM organiser Grant Morgan. "These offshore extremists demonise Islam as an 'evil' force of 'violence', alleging that Muslims in New Zealand will 'terrorise' everyone else in a 'holy war' until they either 'submit' to Allah or are 'killed'. Their denunciation of 'multiculturalism' exposes their racist hostility towards not only Muslims, but also other recent immigrants to this country." "These Australian bigots are speaking at closed-door 'Mosques and Miracles' conferences in Auckland and Wellington between 25-28 July. Their aim is to recruit the leadership core of a racist campaign against New Zealand Muslims and their faith," said Grant Morgan. 'CHALLENGE WEEKLY', an ultra-conservative Christian newspaper circulated mainly within New Zealand's right-wing Baptist and fundamentalist churches. Starting in March 2007, when it carried the headline "Conferences to look at 'threat' of Islam in NZ", this paper has uncritically supported the Islamophobic agenda of the "Mosques and Miracles" conferences. "RAM is organising the Voices of Peace meetings as a positive alternative to the sudden growth of organised racism against Muslims in New Zealand," said Grant Morgan. "RAM supports the values of social inclusion, equal rights for all and world peace. We must win the battle of ideas against the Islamophobes, or else we will end up living in a country where racism has become the dominant ideology." Anti-war MP GEORGE GALLOWAY was recently suspended for 18 days from the British Parliament by pro-war politicians he has been fighting for decades. In the longest investigation in its history, a Westminster parliamentary committee found that Mr Galloway was innocent of any corruption, contrary to the smears of Tony Blair and George Bush, but suspended him anyway. The 10-person committee of pro-war, anti-Palestinian politicians were upset that "proper respect" was not shown to them as they hounded the one British MP who has all along opposed the unjust and murderous occupation of Iraq. Mr Galloway has all along linked George Bush's so-called "War on Terror" with the global spread of Islamophobia, saying that Muslims and their faith are being demonised in a bid to legitimise the US state's crusade for oil and power. The British MP shot to world fame in 2005 when he testified before the US Senate and in effect put George Bush and his cronies "on trial" for war crimes. "Voices of Peace is being held to counter the first stirrings of organised Islamophobia in New Zealand," said RAM organiser Grant Morgan. "A group of right-wing Christian extremists from Australia are now in New Zealand to spread a message of hatred towards Muslims and Islam. They claim that Islam is the 'anti-Christ' and that Muslims are 'on the march' to take control of New Zealand. They allege that Muslims will destroy democracy here and force everyone to 'submit' to Islam, or else be enslaved or killed. They call for the 'mother' of all 'spiritual wars' to be waged against 'evil' Islam." "The purpose of their closed-door 'Mosques and Miracles' conferences in Auckland and Wellington is to incite hundreds of people into forming the core of a racist campaign against New Zealand Muslims and their faith," said Grant Morgan. One of the main "Mosques and Miracles" speakers is Daniel Shayesteh, an extreme right Christian preacher from Sydney. His ministry in Australia, called "Exodus from Darkness", seeks to convert Muslims to his version of fundamentalist Christianity through a lurid depiction of Islam as the satanic force of darkness. Shayesteh claims to be a convert from an Islamic revolutionary organisation in Iran. He was elected to Khomeini's government in 1981, but after political disagreements with the Iranian regime he fled to Turkey in 1988. From there he entered Australia with the help of fundamentalist Christians. He taught business at the University of Technology in Sydney for eight years, but was fired after complaints about his extremist Christian harassment of others. He then began a new career: the demonisation of Islam. In a letter to New Zealand's "Investigate" magazine (July 2007), Shayesteh wrote that he is "speaking out" to people in the West about the "dangers of Islam". Since 2003, he said, "I have been travelling worldwide, including NZ, to spread awareness [about Islam]." Shayesteh is funded by several extreme right Christian groups, including The Christian & Missionary Alliance (a US-based evangelical coalition which is antagonistic to Islam) and Open Doors (a closed-door organisation which sees Christianity as a "persecuted church"). The New Zealand chapter of Open Doors is organising the "Mosques and Miracles" conferences in Wellington (25-26 July) and Auckland (27-28 July). The phone number of Open Doors is (09) 620 4200. 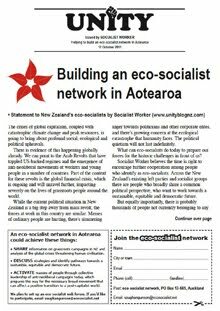 In New Zealand, Shayesteh is uncritically supported by "Challenge Weekly" newspaper which circulates widely inside right-wing Baptist and fundamentalist churches. "[The Qur'an] is a book of war, which turns Muslims against the world," alleges Syahesteh on his website. "Jihad is the Arabic word for 'war' against non-Muslims... It's very important for people in the West to understand that Islam is not a religion of peace. Any Muslim who doesn't get involved in Jihad is sinning. That's the doctrine of Islam." Another Shayesteh quote: "...Muslims want you to accept Islam as your religion; otherwise, they are not going to stop terrorism. To stop fighting against infidels is a sin in Islam." And another: "Islam is the only religion that decrees the demolishing of other religions even to the cost of killing their followers unless they follow Muhammad." Shayesteh's website (www.ministryblue.com/exodus) is full of similar quotes. More quotes appear below. Shayesteh is closely linked to the reverend Fred Nile, national president of Australia's ultra-conservative Christian Democratic Party who was elected to the New South Wales parliament. Nile has advocated a moratorium on Muslim immigration into Australia and a ban on Muslims being elected to the NSW parliament. Shayesteh, on his website, praises Nile for being "a heart for this nation" and for his "support of what I am doing". "The alliance between Syahesteh and Nile points to the political agenda of the Australian Islamophobes now touring New Zealand," said Grant Morgan. "They aim to incite non-Muslim communities into a war against our own Muslim community. 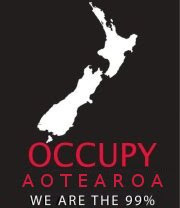 But this is not the sort of New Zealand that the vast majority of our citizens want." "RAM is organising Voices of Peace as a positive alternative to their racism against Muslims. RAM supports the values of social inclusion, equal rights for all and world peace. We are heartened by the groundswell of support that Voices of Peace is receiving from grassroots people. And we are proud to have such a powerful voice for world peace as George Galloway on our platform," said Grant Morgan. "All my talks were about... the way to combat the threat of Islam..."
"Both the Qura'an and the Sharia commands Muslims to prepare themselves for terrorizing... Christians and non-Muslims." "Islam is not a peaceful religion... We see that Islam is fighting all nations... It's the holy war of Islam..."
"Muslim ideology is cloaked in violence... The Muslim holy book seeps with violence... Osama bin Laden is the servant of Islam. Islam is the enemy of this country... Osama bin Laden can be changed, but Islam cannot. Osama bin Laden is just a tool in the hand of Islam." "[Muslims] have to terrorize Christians and Jews by frightening them. By killing them, [Muslims] can take Islam... to the rest of the world." "Islam does not believe in freedom and democracy... If you criticize Islam and Muhammad, your fingers should be chopped [off] first and then your head." "It was Jesus who said love your enemy and fight against evil [Islam]... It is impossible to change Islam." "The Kingdom of Allah on earth would mean the elimination of all other religions. At the top of the list are Judaism and Christianity." "[Shayesteh] urged people to avoid a passive approach to multiculturalism unless they wanted to see Judeo-Christian and democratic values indiscriminately uprooted from their communities and nation [by Islam]." "Islam teaches lying, deceiving, etc as legitimate tools for the sake and progress of religion." "Muslims... will not compromise with the West, but they are delighted if the West chooses to compromise with Islam." "...Radical Islam... acted as suicide bombers because of their own spiritual imprisonment... Nothing could change the heart of a hostile Muslim except Jesus. If we introduce radical Muslims to Jesus, Jesus will transform them from the kingdom of darkness into the kingdom of light... Their problem is fundamentally spiritual..."
"A group of hard-core, professional Islamophobes from Australia are coming to New Zealand in a few days time to spread a message of hatred towards Muslims and Islam," said RAM organiser Grant Morgan. "These right-wing Christian extremists claim that Islam is the 'anti-Christ'. They claim that Muslims are 'on the march' to take control of countries like New Zealand. They claim that Muslims will destroy democracy here and force everyone to 'submit' to Islam, or else face being enslaved or killed. They call for the 'mother' of all 'spiritual wars' to be waged against 'evil' Islam." "These and similar racist claims are the theme of a 400-page book titled 'Mosques and Miracles' which is the ideological framework for their New Zealand conferences of the same name. The lead speaker at these conferences is the book's author, Australian Baptist preacher Stuart Robinson." "These right-wing Australian bigots are out to poison the minds of fundamentalist Christians at closed-door conferences in Auckland and Wellington. They want to incite hundreds of people into forming the core of a highly political campaign against New Zealand Muslims and their faith," said Grant Morgan. "Ironically, the organising body of their closed-door conferences is Open Doors, a fundamentalist Christian group operating on both sides of the Tasman as well as in many other countries. The closed-door secrecy of Open Doors highlights their deliberate use of misleading language, such as their fraudulent claims to really 'love' Muslims." "RAM is organising Voices of Peace as a positive alternative to their racism against Muslims," said Grant Morgan. "RAM supports the values of social inclusion, equal rights for all and world peace. We are heartened by the groundswell of support that Voices of Peace is receiving from grassroots people and their community leaders." Organiser of the Auckland Council of Christian, Muslim & Jewish Youth. "The NZ Council of Christian, Muslim & Jewish Youth is highly supportive of any endeavour to encourage religious coexistence. We strongly assert our vision of harmony between faiths through mutual understanding to counter those whose views are divisive and promote ignorance and intolerance. Thus we strongly support the Voices of Peace initiative as a demonstration of hope in a world unnecessarily perceived as being divided between competing religious ideologies." Director of the Working Group on Alternative Security Perspectives. "New Zealand has more to fear from tsunamis than it does from Islamic terrorism because it has no history of meddling in the affairs of Islamic countries. However, since 9/11 New Zealand has adopted a more hostile policy towards Muslim immigrants and has increased scrutiny of the resident Muslim population. This policy is exactly the type of scapegoating and discrimination that breeds resentment amongst disenchanted elements of targeted communities. By any objective criteria, Islam poses no threat to the Kiwi way of life unless New Zealand authorities and the public continue to ostracise Muslims simply because of who they are." President of the Federation of Islamic Associations of New Zealand. "While Muslims in New Zealand generally live in peace with others, Muslims in other countries are not so lucky. I hope that George Galloway will enlighten New Zealand on the plight of Muslims facing a rising tide of Islamophobia. This racism against Muslims is linked to the so-called 'War on Terror', which was never sanctioned by the United Nations. It was simply a ploy of the superpowers to plunder the rich resources of the Middle East. To defeat terror and religious extremism, Muslims, Christians, Jews and all others should practice a 'unity in diversity'. This will surely lead to peace and harmonious co-existence for all humanity. All faiths have a common theme of working for peace as a basic condition for leading lives acceptable to God Almighty. This was the message of all our prophets and seers of all ages." RAM councillor on the Auckland Regional Council. "New Zealand is a small country, so Kiwis know what it is to be a minority. That's why Kiwis get in behind the All Blacks and Team NZ when they represent our small nation in David and Goliath events. It is this camaraderie that makes us unique as a people. We support those who are doing brave and courageous things. This generosity of spirit extends to standing up for those who are being bullied. We won¹t put up with it. While not a believer, I will defend anyone's right to their religion, so long as they do no harm to others. The Muslims I have met are kind and loving people, unlike religious bigots who spout their hatred of those who do not share their beliefs." Organiser of the Working Together Group within the Muslim community. "We in New Zealand have been enjoying peace. Let's stand together to defend it and close the door on the messengers of hate. All of us, black and white, Pakeha and Maori, Muslims and non-Muslims, believers and non-believers, should stand shoulder to shoulder to deny the messengers of hate a foothold on our islands. We are the majority, they are the minority. Let our voices of peace be loud." Co-president of the NZ Council of Christians & Muslims. "The National Statement on Religious Diversity was recently adopted in draft form as a basis for ongoing discussion within our nation. It seeks to provide a framework for the recognition of New Zealand's diverse faith communities and their harmonious interaction with each other and with other groups in society. This positive initiative stands comfortably alongside the work of the Council of Christians & Muslims which promotes mutual understanding and respect between our two faith communities. Voices of Peace provides yet another voice for the building of an inclusive, just and non-discriminatory society in Aotearoa/New Zealand, a vision which CCM thoroughly endorses." Young Muslim woman speaking at Voices of Peace university meeting. "New Zealand is known as a country that respects the values and cultures of its citizens, irrespective of their origins and background. New Zealanders are not people who tolerate injustice, or acts of hatred and prejudice. Positive race relations and religious acceptance have become important features of this society's attitudes, and Muslims have taken part in building and shaping this country over the last century. People who encourage intolerance, misunderstanding and hate towards Muslims in this country do so from a position of ignorance about Islam. Inclusion, rather than community division or marginalisation, is the New Zealand way. It's the way forward for the future." Vice-chancellor emeritus of AUT University and Auckland City councillor. "More than ever before, with the huge arsenals of nuclear, bacteriological and chemical weaponry, we must learn to respect and affirm our differences of belief. Every religion seems cursed to have its supply of fanatics. We must embrace those many Muslims who share with so many Christians the ways of love, peace and respect for everyone, regardless of their beliefs or backgrounds. Those self-righteous fanatics among every religion, including Christianity and Islam, who affirm a faith that engenders violence and hatred must be challenged to find the true teachings of their prophets and theologians." Venue to be confirmed, but will almost certainly be the Library Basement, University of Auckland, Alfred St, central city. "The 10-person committee of pro-war British MP's who suspended George Galloway from the Westminster Parliament are spinning a web of deceitful propaganda," said Grant Morgan, organiser of RAM - Residents Action Movement. "If they're prepared to demonise Muslims to further their imperial crusade for oil and power, they're certainly ready to hound Britain's most famous anti-war MP with a pack of lies." "The Islamophobic propaganda of pro-war fanatics such as the ten MP's who suspended Mr Galloway merges with their politically-inspired campaign against the political leader of Britain's Stop the War movement," said Grant Morgan. "However, grassroots people know better than to trust the propaganda of the political elite who ook the West into an unjust and indefensible war in Iraq. Their kangaroo court will be judged in the court of public opinion." "This injustice in a small sub-committee of Britain's Parliament will merely add weight to Mr Galloway's speeches in New Zealand against the global injustice of Islamophobia." 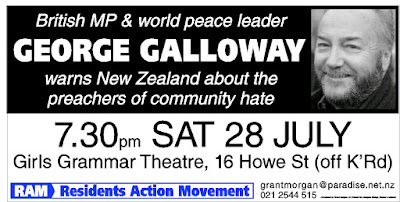 George Galloway is speaking at Voices of Peace meetings in Auckland on 27 and 28 July organised by RAM as a positive alternative to the first stirrings of organised Islamophobia in New Zealand. For more information, contact Grant Morgan (details below). And the in-depth analysis below will show you how the kangaroo court is operating. d) What he had done was tantamount to treason. This was libellous, and these remain defamatory claims to make. However. Immediately upon hearing of the allegations, a pro-war hard-right Tory MP named Andrew Robathan wrote to the Committee on Standards and Privileges to demand that an inquiry be made into them, reminding them as he did that he had fought in the Gulf War. Subsequently a prolonged inquiry was held into this matter, and the Committee has now concluded that George Galloway will be suspended for 18 days from the House of Commons for "damaging the reputation of the House". This may seem curious. After all, the Commissioners accept Eady's definition of the libellous claims, and the Commissioner for Parliamentary Standards either acknowledges that George Galloway did not personally benefit from "moneys derived from the former Iraqi regime", or accepts that George Galloway did make many declarations of interest over Iraq, eleven times. Further, he finds no instance in which monies from the appeal were improperly spent. There is no suggestion that George Galloway attempted to deceive anyone about his involvement in the Appeal or his interest in the matter. The Commissioner does not believe that George Galloway's views or advocacy were a result of receiving money from Saddam Hussein, because he doesn't accept that George Galloway's views changed or that he received money from Saddam Hussein. The complaint made by Andrew Robathan is clearly unsubstantiated: this should have concluded the matter. So, what gives? Well, here's a clue: the majority of the Committee voted for the war on Iraq. Two of its members are former chairs of the Labour Friends of Israel. One of them, Kevin Barron MP, played a pivotal role in the witch-hunt of miners’ leader Arthur Scargill in 1990. Seasoned red-baiters and warmongers, then, and they had to find him responsible for something. Here is the basis of the suspension: he called into question the motives of the inquiry and therefore brought the House of Commons into disrepute. That is to say, because he dared to suggest that a committee of ten members of parliament might have a political motive, he is suspended. This is pathetic. Now, the committee did make other complaints, which Galloway disputes, but they say these would have resulted merely in a request for an apology. Namely, they say, George Galloway: didn't use his parliamentary resources in a "reasonable" fashion by using them to help the Appeal (this is stretching the definition of what is "reasonable", but those are the breaks with a bunch of pro-sanctions, pro-war MPs); didn't cooperate with the inquiry and tried to conceal "the true source of Iraqi funding" from them (in fact, the claim that Galloway didn't cooperate is belied by the record of transactions which is available on the website of the committee, in which the Commissioner notes as late as November 2006 that he was very content with Galloway's cooperation); wasn't quite forthcoming enough about declaring his interests (despite the fact that he did discuss it in the House of Commons numerous times, widely advertised the appeal, held meetings in the house, and consequently was satirically known as 'the MP for Baghdad Central'); did not register the Appeal in the Miscellaneous Category (although as they concede, he was not directed to do so when he consulted the previous Commissioner in 1999). This ragbag of petty complaints is the sum of a great effort made over several years to try and impugn the reputation of an antiwar MP. Added to it are several bizarre implications, which occur throughout the deliberations, but not in the recommendations. At one point, the Commissioner raised a 'suggestion' that had been made to him that Elaine Galloway, George Galloway's former spouse, received £13,000 in payments from the appeal. The Commissioner then claimed to have 'forgotten' who 'suggested' this to him. This allegation of criminal behaviour rests on the person of Ms E Laing, who received payments from the appeal: the implication was that Ms E Laing could be made to look like 'Elaine'. But, as the Commissioner acknowledges, George Galloway tracked down Ms E Laing and passed on the details to him, and so there is no mystery about who Ms E Laing is and what the sum was paid for (secretarial work), and who paid it (Stuart Halford, since she has his personal assistant). So, this smear was introduced into the proceedings and instead of being removed or clarified, was deemed 'peripheral'. Additionally, a photocopy of a purported "minute" of a meeting between Galloway and Hussein in 2002 was introduced at the last minute, having landed on the commissioner's desk some hours before a meeting with Galloway. It was without any explanation as to its specific provenance or how it remained secret until then. It purports to show Galloway suggesting that some of his work on behalf of the Mariam Appeal might be financed by "an oil-related mechanism". The only possible explanation as to its provenance, provided by Ms Alda Barry, was stricken from the record. She explained that it would have been a tape recording. However, since Galloway supplied the Commissioner with the evidence that there had not and could not have been such a tape recording, a letter of apology was sent by the Commissioner on 17th April 2007 to George Galloway, in which he apologised for having tried to prove that such a tape existed. His report nevertheless left open the 'possibility' of such a tape. We are told that it comes from 'intelligence' and that the commissioners "take the view that the alleged record of the meeting between Mr Galloway and Saddam Hussein in August 2002 is authentic", even though they acknowledge that it has not been "substantiated". Similarly, the Committee members decide, citing only one of the experts who looked at the Telegraph's documents (while ignoring the existence of other forged documents), that on balance they think they're probably not forgeries: whether they are forgeries or not, the information contained in them is certainly untrue, as the Commissioner also concedes. They breach their own standards, too, by insisting on including claims made by utterly discredited witnesses, including one "Tony" Zureikat, whose evidence supposedly supports the claims in the 'minute', but who manages to get the time of the meeting wrong by at least six months (he is vague: it happened in Christimas time or New Year, according to him). Given that the nature of the evidence they adduce is so flimsy, and so disreputable, the Committee's decisions are naturally sparse. You might have thought that a Committee that was confident in its various assumptions would be a bit more harsh than asking for an apology for not having registered the appeal in Miscellaneous and so on. You might have thought that the basis of a suspension from the House of Commons for bringing it into disrepute would be somewhat stronger than that George Galloway said mean things about the committee's motives. Instead, they have produced a great many conclusions, which proceed from ommissions and distortions, and as such the best that they could do with it was trump up some sort of headline-grabbing charge. How pathetic, and how risible. If the Commissioners don't realise that they have brought themselves into disrepute with this disingenuous charade, this can only further confirm the impermeability of the Westminster village to the real world. "A prime catalyst for the Voices of Peace meetings is the Mosques & Miracles tour being organised in New Zealand around the same time to spread the message of Islamophobia," said RAM organiser Grant Morgan. "The Mosques & Miracles tour has been inspired by the 400-page book of the same name written by Australian right-wing Baptist pastor Stuart Robinson." "Mr Robinson's 'Mosques & Miracles' book calls for the 'mother of all 'spiritual wars' to be fought against 'evil' Islam, which represents the 'anti-Christ' and is 'on the march' to destroy our liberties and freedoms by waging war on all non-Muslims until they 'submit' or are enslaved or killed," said Grant Morgan. "Mr Robinson will also be one of the keynote speakers at the Mosques & Miracles conferences. He will be joined by a group of other extreme right evangelical Christian preachers from Australia." "By shaping their New Zealand conferences around Mr Robinson's Islamophobic book, the Mosques & Miracles ideologues from Australia will be stirring up racist bigotry against other human beings simply because they follow a different faith and often originate from a different part of the planet." "RAM asks: Why are the Mosques & Miralces meetings closed to the public, except for one short session? If their message was wholesome, why would they try to hide it from scrutiny by the public and the media? Are they attempting to secretly recruit an Islamophobic cadre here in New Zealand as a necessary first step to building a political movement against Muslim immigrants?" "The vast majority of New Zealanders reject their sectarian message of division and hate between communities in this country. That is why RAM is organising the positive alternative of Voices of Peace. We are aiming for broad unity around the values of social inclusion and equal rights for every religious believer and non-believer," said Grant Morgan. "Our call will be amplified by having George Galloway on our Voices of Peace platform. Mr Galloway, a British MP who is world famous as an advocate of social justice and world peace, will be showing how the roots of Islamophobia are to be found in the US war in Iraq." "[We face] the threat of having all nations becoming Islamic states and governed by Islamic law (shariah)... The Islamic challenge to the church if not Western society... is in all of our cities and neighbourhoods ­ now! Islam and Christianity are on a pathway of confrontation." "A firm foundation has been laid to achieve the ultimate goal of the Islamisation of the United States... Islam is much more than just another ethnic lobby group. As its influence grows it is bound to have repercussions on the whole American way of life... Such concepts as 'life, liberty and the pursuit of happiness'... are almost unimaginable within pure Islam... The clash that is likely to occur as Islam increasingly impacts within America is potentially of cataclysmic proportions. In an article entitled 'The New Ideological Enemy', a think tank of the Pentagon considered that a confrontation with Islam was inevitable... The threat to the American way of life does not come from some militarily inferior cluster of far off powers. It comes from within... If the present trend continues it could well be that one day the stars and stripes may be replaced by the crescent moon." "Until the entire earth and all of its inhabitants are both returned to the rulership of Allah and acknowledged as such by all, then war must be pursued against those who have yet to submit. Peace is impossible... Islam's expansion by means of military conquest is not an occasional event but a... religious obligation." "No non-Muslim is considered equal to any Muslim." "On July 9 1935 Winston Churchill warned his countrymen, 'There lies before us a period of strain and peril which I do not think has been equalled ­ no, not even in the Great War [World War I]'... But in England people and their leaders wanted to believe that there would be only peace and prosperity ahead... No less a call should be sounded in our time as Islam organises, finances, equips and implements its strategies around the world. The question is, 'Will we be like the leaders of Europe in the lead up to what became the Holocaust of World War II or will we respond more appropriately while there is yet time?'... We at least [must] acknowledge we are facing an unprecedented challenge of immense proportions." "What Islam historically and consistently exhibits is certainly not the pattern of the Biblical Kingdom of God on earth. Its origins therefore, are elsewhere... The Quran... makes no categorical condemnation of occult practices... What sort of belief system despises the cross and so vigorously denies the death of Christ?... [Ex-Muslim Christian evangelist] Reza Safa concludes that such could only originate from the anti-Christ..."
"For many years to come, oil from the Middle East will remain an economic jugular for the Western world. If it is closed there would be massive disruption to Western economies... [Extreme right-wing ideologue] Samuel Huntington believes that 'The actions of the oil-rich Muslim states... amount to nothing less than a bold attempt to lay the Christian West under tribute to the Middle East'." "Islam is on the march and it has reached well within the borders of all Western nations... The spiritual battle has already been joined... Each [person] needs to... reaffirm that we are involved in spiritual warfare and be prepared to enter into it... A spiritual war is being waged... It is the war between good and evil, darkness and light, God and his adversaries. This is the mother of all wars. War is not being fought over one country or one issue but for the hopes and fears of all humanity." More quotes from Stuart Robinson's book, and/or a colour scan of its front cover, are available from RAM organiser Grant Morgan. Email grantmorgan@paradise.net.nz or ring 021 2544 515. PAUL BUCHANAN, international security analyst & director of the Working Group on Alternative Security Perspectives at the University of Auckland. GRANT MORGAN, organiser of RAM ­ Residents Action Movement. Limit of 800 seats, so those interested are being advised to get there early. NO DOOR CHARGE. Donations will be accepted. STUDENT REPRESENTATIVE of the campus organising group. There will also be Voices of Peace workshops where topics touching on Islamophobia can be discussed together by Muslims and non-Muslims. George Galloway will give the introduction. Limit of 250 participants, so those interested are being advised to get there early. (a contribution from Socialist Action (UK)) Chavez's visit to London in mid-May (2006) gave an opportunity to deepen understanding of many details of the Venezuelan revolution. Particularly instructive were emphases in Chavez's speech to the solidarity rally in Camden Town Hall on 14 May. First let us return to fundamentals. What is taking place in Venezuela is the first self-defined and conscious attempt to create a socialist society since the Sandinista revolution in Nicaragua. It is therefore also the first offensive struggle at a state level for over 25 years. That is already momentous. After a quarter of a century the working class is waging a direct struggle for state power. Furthermore the Venezuelan revolution has the specific form of being the first successful taking of state power essentially through urban insurrection since the Russian Revolution of 1917 and its immediate aftermath. Naturally the decisive moment of urban insurrection in Venezuela started in defensive form, in the defeat of the coup of April 2002, but form is not decisive. The essence of the issue is that over one million people descended into the streets, a number armed, against the attempted military coup d’etat. Through this insurrection the top echelons of the army that supported the coup were decisively isolated and crushed and the rank and file soldiers went over to the side of the insurrection. This created both the unique opportunity of the Venezuelan revolution, that the core of the capitalist state power, the military reaction, was defeated, and many of the difficulties - elements of state power outside the army and the direct slums and working class areas remained organised, and even controlled, by forces totally hostile to the revolution. 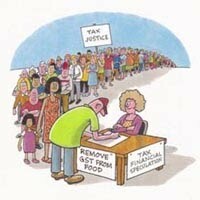 This applies even to large parts of the civil service, the police, the media, companies etc. The process since the insurrection of April 2002 therefore includes the spreading of revolutionary power into wider and wider layers of society – most notably into the oil sector. That the core of the Venezuelan revolution was an urban insurrection differentiates it from the revolutions after 1917 that overthrew capitalism. The Chinese revolution, the Vietnamese revolution, the Yugoslav, and the Cuban revolutions were all based on rural guerrilla warfare – often of a prolonged type. These combined the tasks of the bourgeois democratic and socialist revolutions in the specific form that the peasants carried out a bourgeois democratic revolution in the countryside, which smashed the bourgeois state apparatus and allowed a working class power to be constructed to destroy capitalism in the urban centres. These revolutions delivered huge objective gains compared to what had proceeded them – the expulsion of imperialism from China, the unification of that country, the freeing of Vietnam from French and US imperialism, the defeat of fascism in Yugoslavia, the establishment of universal literacy, the creation of health and other welfare services, huge steps forward in the position of women. Nevertheless the extremely economically underdeveloped character of China and Vietnam, in particular, at the time of the revolution, the essentially bureaucratised military character of the organisations that led these struggles etc meant that these huge gains were nevertheless partial and these parties did not function as fully developed universal vehicles of human liberation – narrow national prejudices were maintained, the position of women, while greatly improved, was far from adequate, reactionary positions were adopted on issues such as gay rights, etc. These were both wrong in themselves and limited the attractiveness of these revolutions in other countries. The urban character of the Venezuelan revolution, which is in turn linked to the fact that it is a society at a much more economically advanced state of development than China or Vietnam at the time of their revolutions, means that right from the beginning it not only serves the basic economic and social needs of the Venezuelan people but is a far more advanced agency of universal human liberation. Chavez at this speech in London devoted large sections of his speech to the position of women and to the fight against racism while also raising issues such as disability rights. The Mayor of Caracas has erected a flag declaring the city a ‘homophobia free zone’. It is also evident that the struggle in Venezuela is intrinsically, and consciously, linked to the international struggles taking place around it. So far also the social transformation of Venezuela has been able to proceed while maintaining democratic rights – indeed the main threat to the latter comes from external military intervention, civil war etc. A process is therefore unfolding which combines social progress and democracy – a deeply attractive model in all countries. These features allow clear identification of the character of the forces leading the social transformation, the revolution, in Venezuela. This is not a process where one fights on the same side as other forces against imperialism or a worse enemy despite fundamental disagreement and contradictions with them – as was the case for example with the unequivocal necessity to fight on the same side as Stalin against the Nazi invasion of the Soviet Union, or Khomeni against the Shah of Iran. The current leading the Venezuelan process is a political current that one is part of, that one identifies with. Does this mean that victory is certain, or that such a current may not change its character in the case of such defeats? Not remotely. Victory is never certain, and defeat is always possible. It means however that on the face of the planet there are now two places, and one political current, that one is part of and identified with – in Cuba and Venezuela. The urban insurrectional core of the Venezuelan revolutionary current creates a dynamic which makes it the force with the greatest potential to appeal to the population of economically advanced countries to emerge for a prolonged period. All the political conclusions flow from that. Galloway "delighted to speak in Auckland"
"I am delighted to be invited to speak in Auckland against the rising tide of Islamophobia. Racism against Muslims is the accompanying factor of George Bush¹s so-called War on Terror," said British Respect MP & international peace campaigner George Galloway. Expelled from the British Labour Party for opposing the US war in Iraq, Mr Galloway shot to world fame in May 2005 when he testified before the US Senate to reject allegations of taking money from Saddam Hussein to help Iraq break American trade sanctions. During his Senate appearance the left-wing British MP turned the tables on pro-war politicians by charging the administration of US president George Bush with war crimes in Iraq. The politically-inspired allegations against Mr Galloway were finally laid to rest in March 2007 when the London Metropolitan Police and the British Serious Fraud Office announced that he had no case to answer. "Demonising the peoples of the Middle East who resist Western rule leads inevitably to demonising their co-religionists who live in the West," said Mr Galloway. "The result is racism and bitter alienation among young Muslims, providing the very breeding ground for nihilistic acts of terrorism which the war is purportedly waged to reduce." "Islamophobia is also the smokescreen for the failure of US imperial policy in Iraq and the wider Middle East. It is rising along with the savage death toll in Iraq ­ of Iraqis themselves and of American and British troops." "We will not end this new racism unless we end the wars of aggression that breathe life into it. That¹s the message I will be bringing with me to New Zealand. And, from what I know of the country, I anticipate a warm response," concluded Mr Galloway. Contact RAM organiser Grant Morgan for a photo of George Galloway. Email grantmorgan@paradise.net.nz or call 021 2544 515. Norm Coleman is a fool. Not an ideological nut case, not a partisan whack, not even a useful idiot ­ just a plain old-fashioned, drool-on-his-tie fool. The Minnesota Republican senator who took Paul Wellstone's seat after one of the most disreputable campaigns in American political history has been trying over the past year to make a name for himself by blowing the controversy surrounding the United Nation's Oil-for-Food program into something more than the chronicle of corporate abuse that it is. The US media, which thrives on official sound bites, was more than willing to lend credence to Coleman's overblown claims about wrongdoing in the UN program set up in 1996 to permit Iraq -- which was then under strict international sanctions ­ to buy food, medicine and humanitarian supplies with the revenues from regulated oil sales. Even as Coleman's claims became more and more fantastic, he faced few challenges from the cowering Democrats in Congress. But when Coleman started slandering foreign politicians, he exposed the dramatic vulnerability of his claims that the supposed scandal was much more than a blatant example of US corporations taking advantage of their powerful connections in Washington to undermine official US policy, harm the national interest and profit off the suffering of the poor. The Senate investigation that Coleman sought regarding the Oil for Food program has already revealed that the Bush Administration failed to crack down on widespread abuse of the Oil for Food program by US energy companies, and that US oil purchases accounted for the majority of the kickbacks paid to Saddam Hussein's regime in return for sales of inexpensive oil. Indeed, the report concludes: "The United States (government) was not only aware of Iraqi oil sales which violated UN sanctions and provided the bulk of the illicit money Saddam Hussein obtained from circumventing UN sanctions. On occasion, the United States actually facilitated the illicit oil sales." Instead of forcing the President, his aides and the executives of Bayoil, the Texas oil company that the report shows paid "at least $37 million in illegal surcharges to the Hussein regime" ­ money that helped the Iraqi dictator solidify his grip on power ­ Coleman started to make wild charges about European officials such as British parliamentarian George Galloway. The problem for Coleman is that Galloway is not a standard-issue American politician -- the kind who has nothing to say and says it poorly. He is a veteran of the rough-and-tumble politics of Glasgow and the equally rough-and-tumble politics of the British Parliament. In other words, Galloway comes from places where voters and politicians do not suffer fools. And anyone who has ever followed British politics knows that George Galloway has beaten every political challenge he has faced -- even those posed by British Prime Minister Tony Blair. Galloway called Coleman's bluff and flew to Washington for a remarkable appearance before the Senate Permanent Subcommittee on Investigations. "I am determined now that I am here, to be not the accused but the accuser," Galloway announced as he stood outside the Capitol Tuesday. "These people are involved in the mother of all smokescreens." The member of Parliament tore through Coleman's flimsy "evidence," issuing an unequivocal denial that began, "Mr. Chairman, I am not now, nor have I ever been an oil trader, and neither has anyone been on my behalf. I have never seen a barrel of oil, owned one, bought one, sold one, and neither has anybody on my behalf." He accused Coleman of being "remarkably cavalier with any idea of justice" and pointed out error after error in the report the senator had brandished against him. For instance, Galloway noted that he had met Saddam twice -- not the "many" times alleged by the report. "As a matter of fact I have met Saddam Hussein exactly the same number of times that [Secretary of Defense] Donald Rumsfeld met him," said the recently re-elected British parliamentarian. "The difference is that Donald Rumsfeld met him to sell him guns." For good measure, Galloway used the forum Coleman had foolishly provided to deliver a blistering condemnation of Coleman's war. "Now, Senator, I gave my heart and soul to oppose the policy that you promoted. I gave my political life's blood to try to stop the mass killing of Iraqis by the sanctions on Iraq which killed one million Iraqis, most of them children, most of them died before they even knew that they were Iraqis, but they died for no other reason other than that they were Iraqis with the misfortune to born at that time. I gave my heart and soul to stop you committing the disaster that you did commit in invading Iraq. And I told the world that your case for the war was a pack of lies," Galloway informed the fool on Capitol Hill. "I told the world that Iraq, contrary to your claims, did not have weapons of mass destruction. I told the world, contrary to your claims, that Iraq had no connection to Al Qaeda. I told the world, contrary to your claims, that Iraq had no connection to the atrocity on 9/11, 2001. I told the world, contrary to your claims, that the Iraqi people would resist a British and American invasion of their country and that the fall of Baghdad would not be the beginning of the end but merely the end of the beginning. "Senator, in everything I said about Iraq, I turned out to be right and you turned out to be wrong, and 100,000 people paid with their lives; 1,600 of them American soldiers sent to their deaths on a pack of lies; 15,000 of them wounded, many of them disabled forever on a pack of lies. "If the world had listened to [UN Secretary General] Kofi Annan, whose dismissal you demanded, if the world had listened to [French] President Chirac, who you want to paint as some kind of corrupt traitor, if the world had listened to me and the antiwar movement in Britain, we would not be in the disaster that we are in today. Senator, this is the mother of all smokescreens. You are trying to divert attention from the crimes that you supported, from the theft of billions of dollars of Iraq's wealth," argued Galloway. Then the Brit turned the tables on Coleman and steered the committee's attention toward "the real Oil for Food scandal." "Have a look at the fourteen months you were in charge of Baghdad, the first fourteen months when $8.8 billion of Iraq's wealth went missing on your watch. Have a look at Halliburton and other American corporations that stole not only Iraq's money but the money of the American taxpayer," Galloway said. "Have a look at the oil that you didn't even meter, that you were shipping out of the country and selling, the proceeds of which went who knows where. Have a look at the $800 million you gave to American military commanders to hand out around the country without even counting it or weighing it. Have a look at the real scandal breaking in the newspapers today, revealed in the earlier testimony in this committee. That the biggest sanctions busters were not me or Russian politicians or French politicians. The real sanctions busters were your own companies with the connivance of your own Government." by Matthew Davis BBC News in Washington George Galloway had vowed to give US senators "both barrels" and after sitting ­ coiled ­ through an hour-and-half of testimony against him, he unloaded all his ammunition. Far from displaying the forelock-tugging deference to which senators are accustomed, Mr Galloway went on the attack. He rubbished committee chairman Norm Coleman's dossier of evidence and stared him in the eye. "Now I know that standards have slipped over the last few years in Washington, but for a lawyer, you are remarkably cavalier with any idea of justice," the MP declared. The whole room scanned Mr Coleman's face for a reaction. The senator shifted in his seat ­ nervously it seemed. It was the first time a British politician had been interrogated as a hostile witness at the US Senate ­ but Mr Galloway cast himself not as the accused, but the accuser. On stage at the heart of American power, he attacked the US-led war on Iraq and accused Washington of installing a "puppet" regime there. The Scotsman launched into his opening statement with relish. He had never received any money or any allocations of oil from Iraq. He was not, as the committee alleged, a supporter of Saddam Hussein. "I have a rather better record of opposition to Saddam Hussein than you do, and than any member of the British or American governments do," he told the committee. Mr Galloway had expected to testify before a panel of 13 senators in what he termed their "lions' den". But he faced off against just two, Mr Coleman and Democratic counterpart Carl Levin. It was Republican Mr Coleman who bore the brunt of the attack in one of the Senate's most flamboyant confrontations. "Senator, in everything I said about Iraq, I turned out to be right and you turned out to be wrong," he told the chairman, whom he labelled a "neo-con, pro-war hawk". Mr Coleman tried desperately to take it without emotion, but at one point could not resist breaking in to a smile. In the face of Mr Galloway's refusal to accept anything the senators were claiming might be true, they tried to establish a link between a Jordanian businessman who they believe received oil allocations from Saddam Hussein, and Mr Galloway's children's charity. Mr Galloway said the businessman had given money to the charity but he, Mr Galloway, had never known where it came from. The senators believe that it came from Iraq, but they could come up with no proof and their questions ended. Senator Levin later said he was "deeply troubled" that Mr Galloway had "ducked the question". But it was Mr Galloway who looked most satisfied as he left the vast, wood-panelled committee room. Outside in a corridor he told reporters he thought he had put the committee on the ropes, saying of Mr Coleman: "He's not much of a lyncher." The senators, however, were playing down the confrontation. "This was not a wrestling match," Mr Coleman protested. "It wasn't a contest." Asked his reaction to the "unusual" manner of the witness, he replied: "I was not offended by what he had to say, it was not relevant. The theatre, the dramatics ­ I was not looking at that. I had one goal and it was to make a record." The pundits disagreed. One observer of Capitol Hill politics declared the result: "Galloway by a knockout ­ before round five." Others cast the confrontation as Braveheart on Capitol Hill. But though he left the building professing himself satisfied with his trip to Washington, only time will tell whether Mr Galloway has blown away the allegations he described as the "mother of all smokescreens". Mr Coleman said he didn't think Mr Galloway had been a "credible witness". If it was found he had lied under oath, there would be "consequences", he said. NO DOOR CHARGE. Donations will be accepted. Both meetings OPEN TO THE MEDIA. WORKSHOPS There will also be Voices of Peace workshops where topics touching on Islamophobia can be discussed together by Muslims and non-Muslims. George Galloway will give the introduction. 2-5pm, Sunday 29 July. Fickling Convention Centre, 546 Mt Albert Rd, Three Kings. Limit of 250 participants, so those interested are being advised to get there early. Aotearoa LIve- Stop Climate Change!